St. Albans has always been an important Hertfordshire market town, with inreasing growth in electronics and manufacturing in post-war years. Services in the area were operated by a number of independent operators from the 1920's onwards, taking advantage of the fact that National's nearest garages were at Watford and Hatfield. All those operators were acquired between November 1933 and March 1934 by the LPTB mostly through compulsory purchase or refusal of operating licenses. The largest fleets were those of St.Albans & District and Albanian Omnibus. The LPTB concentrated their new operations on the premises of St.Albans & District in Hatfield Road, a former drill hall, and Flowers & Etches (City Omnibus Services) in Wynchlands Cresent, also off Hatfield Road. This building survived until 1986-7 as a warehouse, but has since been demolished and replaced by a house. Additional space for Greenline operation was found in Harpenden, where Comfy Coaches had been based. That the old premises were unsatisfactory is no surprise, and new facilities were rapidly developed. During this period London Transport was a beneficiary of major public works funding as the government tried to kick-start the foundering British economy. Significant investment had already been been made in the southern operating area with garages being built by or for the East Surrey company, but no such provision had been made across the northern operating area. Thus, new garages in the contemporary style developed by Frank Pick and Charles Holden were built at Addlestone, Amersham, Epping, Hemel Hempstead, Hertford, Northfleet, St.Albans and Windsor between 1934 and 1937. In St.Albans the new building, at the North end of St.Peter's Street was opened in 1936. Like several others of the period, it had an integral bus station. None of the others matched the 'Art-Deco' splendour of its reinforced concrete canopies, seating and timetable displays. These remained largely intact until the mid-1980s, when London Country, trying desperately to find space for the growing vehicle allocation, began removing the fixtures and attractive gardens to make additional parking space and access roads. The job was completed by the City Council, who created a car park on the forecourt after the garage was vacated. These acts of vandalism spoiled the attempt to obtain listed building status in recognition of its architectural merit, despite being within a conservation area. The colour pictures from the collection of Tim Pickford-Jones (Timmonet) give a wonderful feeling for the variety of vehicles that could be seen around SA in the early London Country period. Note the red RT staff bus parked at the back, and the SMW class Swift in the bus station. 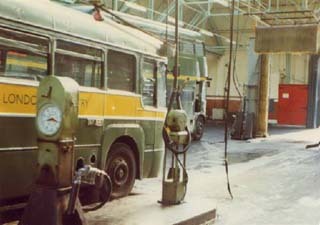 Inside the garage note the antiquated fuel and lubrication equipment, and the RMC coach downgraded to bus duties. At this period the garage had one of the largest allocations of vehicles, over 60, of types MBS, RF, RMC, RP & SMW. He also has a picture of the new housing on the site, which is just too painful to display here. Thanks for sharing the pictures, Tim! 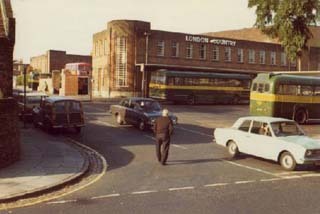 From 1992, the St.Albans Transport Heritage Trust battled towards retention of the building and finding a commercial partner who would occupy part of the site alongside a transport museum housed within the garage buildings. The City Council were supportive, and for several years there was an annual 'Discover St.Albans Rally' and bus operating event. Most interesting was a cinema partnership, for which architectural plans and proposals were submitted for planning approval. However, the high commercial value of the centrally-located site and pre-determination of the City Council towards residential development finally extinguished any hope of saving the buildings. They were demolished in 1998. I am pleased to thank the contributors to the St.Albans Project Supporters newsletter (SA-SO) for much of the information above.